Gayna Mandelbaum Bassin received her Bachelor of Music degree from the Curtis Institute of Music in Philadelphia, and her Master of Music degree from Indiana University. 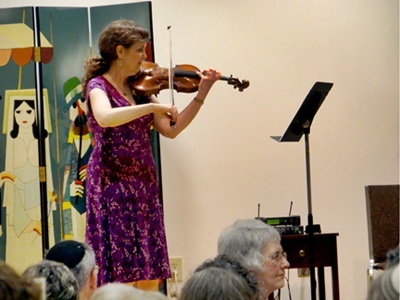 She was a member of the CSO’s First Violin section for twenty years and has been teaching traditional violin and viola at the Wyoming Fine Arts Center since 1997. Mrs. Bassin performed as soloist with the Colorado Philharmonic Orchestra, the Windsor Symphony, and the Cincinnati Community Orchestra. She participated in international festivals including Tanglewood, Blossom, and the Casals Festival in Puerto Rico. She also teaches at Cincinnati Country Day School and her home studio.